The medieval romance novel for our latest Medieval Romance Monday feature is The Lady and the Falconer by medieval romance author Laurel O’Donnell. Logan paced the battlements, just as his father must have done all those years ago. He clenched and unclenched his hands. Graham had returned a few moments ago and announced that Solace was still in the village. Where the hell was she? Logan wondered. Around him, soldiers looked for Barclay’s troops, but his gaze swept the road before the castle for a glimpse of the girl. In the far distance, a line of fire preceded the attacking army, a line that grew hotter and brighter as the torch-wielding warriors moved closer. Even the falcon at his shoulder constantly shifted position, darting its head this way and that, its large brown eyes wide and alert. Lady Alissa stood at the walls not far from him. He heard her mutter soft curses beneath her breath. Her hair was hidden by a red-horned headdress, which made her look like the devil himself. Her eyes were narrowed with anger, her hands balled. Had father been that angry with me? The thought entered Logan’s mind unbidden. He tried to push aside his worry for the girl and concentrate on finding Peter. But he needed Solace to know where to begin. A muted curse slipped from his lips. Alissa placed her fists on the stone wall, her narrowed eyes relaxing as determination filled them. Resolution squared her shoulders, and she raised her chin. Logan felt doom settle like a lead ball in the pit of his stomach. He knew the words she was going to speak, had wished many a night that his own father would have made the same command — to save the castle, to save his family. She opened her mouth just as Logan whirled away in despair to glance at the road. In the soft glow of the moonlight, he spotted a wagon racing toward the castle. He breathed a small sigh of relief and closed his eyes briefly in thanks. But lady Alissa’s words brought his eyes wide in shock. “Close the gates,” she said. “She’s there!” Logan shouted, pointing his finger at the wagon. You can read more about The Lady and the Falconer here. In my research for medieval Christmas traditions, I came across lots of information on holiday fare. 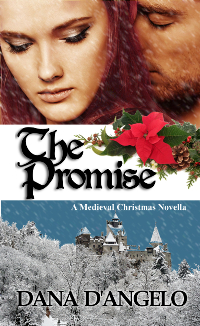 I was tempted to use much of what I found in my new release The Promise, but fortunately or unfortunately my novella is about romance and not about food. Still, I found the topic of medieval food interesting, and I wanted to share my discoveries with you, the readers at medievalromances.com. In general Christmas back in the Middle Ages was different from how we observe it nowadays. One of the main differences, I believe, was that the people ate and celebrated for twelve consecutive days. A lord usually gave his workers time off during the holidays, and sometimes, in a show of generosity, he would treat his underlings to a supper in the great hall. You see, throughout the year people were in a constant state of hunger. But when Christmas rolled around, they allowed themselves to indulge in food and drink. The dishes and drink that these people enjoyed were based on what was available and what they could afford. However they made sure that there was plenty of food during this time. Baked Minced Pie – Minced pie was baked in an oblong shape to symbolize the crib that Jesus slept in. It consisted of shredded meat, fruit, and three spices (cinnamon, cloves and nutmeg) to represent the three gifts offered to Christ from the Magi. The people held a belief that a wish made on the first bite of the pie caused the wish to come true. However if a person refused that important first bite during Christmas, bad luck would follow him in the new year. Pudding or Frumenty – A favorite food during Christmas, frumenty essentially was a spicy porridge made from boiled wheat, currants, dried fruit, yolks, and spices such as cinnamon or nutmeg. The mixture was cooled and then allowed to set before it was served to the early awaiting guests. Golden Roasts – In noble homes, the cooks strived for artistry in their culinary creations. For example, to make a roasted peacock look visually appealing, they would add butter and saffron to paint the meat in a golden hue. When the peacock was finished cooking, they often redressed the gilded bird in its old skin and feathers. Boar’s Head – The boar’s head, with an apple or an orange in its mouth, was presented to guests with great excitement during an extravagant dinner. This rosemary and bay scented centerpiece was considered a noble dish. A big thank you to Dana D’Angelo for this great guest post! You can read more about Dana on her author page here at Medieval Romances, as well as learn about the medieval romances she has written and where you can purchase them.